Maria Taylor visits two local heros of animal medicine and welfare in south-east NSW in this excerpt from her forthcoming book. THERE ARE A lot of kangaroos in my neighourhood on the fringes of the national capital. 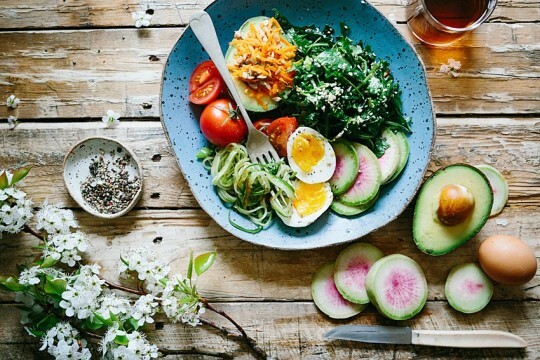 The countryside is rural residential — a mix of hobby-block farming, people who feed horses, and people who live in remnant bushland that has escaped or regrown from the clearing for sheep grazing 75 to 100 years ago. The grazing activity led to widespread land degradation on relatively poor soils. Subdivision to small blocks has led to considerable tree planting and some restoration of wildlife habitat. 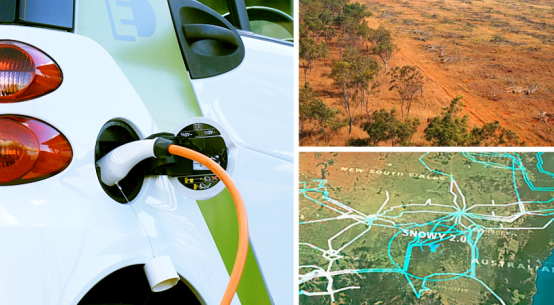 The kangaroos and wallabies and other wildlife lost grassland and shelter habitat with the new houses and roads. On the other hand marcropods weren’t getting shot anymore on the new rural residential blocks carved out of the animals’ former home ranges. So they stayed, and were joined by others seeking shelter from remaining nearby farmland. 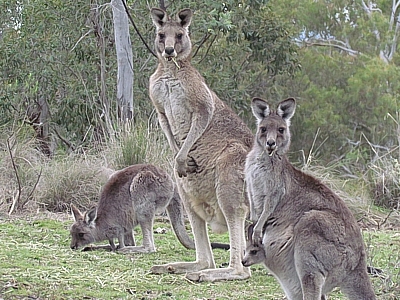 Here, kangaroos, wallabies, lizards, possums and many bird species share our rural paradise. Many of us love the proximity. While most Australians never see a kangaroo or a wallaby in the wild, we feel privileged to share the block and some feed with many of them. I glance out the window as I write and see a young redneck wallaby methodically mowing tasty, green post-rain grass on a patch that once aspired to be lawn. An older animal keeps watch. 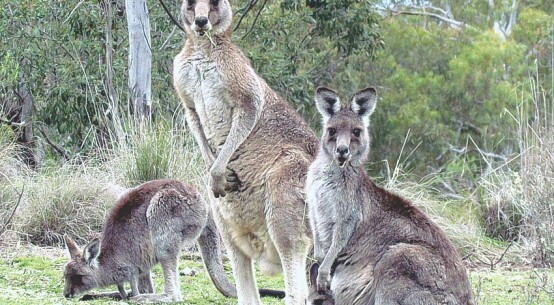 Nearby in a new subdivision I have seen 20 kangaroos on newly-laid turf in front of a house. Across the street another 20. More on other blocks. That land used to be their home range. They have nowhere else to go. 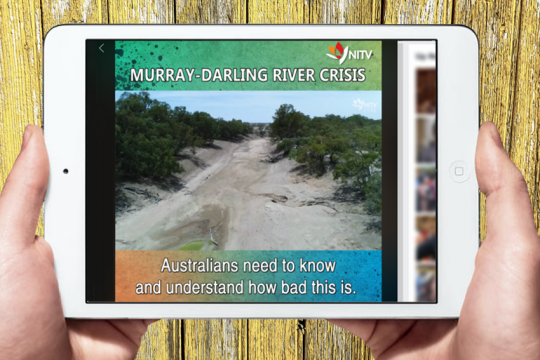 Big landholders shoot on neighbouring properties. Now in addition, sometimes deadly fences, dogs, and motor vehicles are their main predators. Not far from where I live, Rosemary Austen and her partner Steve Garlick rescue or take in the injured victims of car, fence and malignant humans at their Possumwood recovery and research centre. In addition to Possumwood, there are dedicated volunteer wildlife carers for an organisation called Wildcare in our area. Dr Austen, a general medical practitioner and also credentialed microbiologist and zoologist, performs the front-line emergency care. Then begins the challenging phase of long-term recovery care, which is not the easiest with wild animals. At any one time Possumwood has 40–50 animals in residence including kangaroos, wallabies, wombats, birds and other road and fence casualties. They even once helped an eagle recover. Across 15 years several thousand animals have been helped and released. 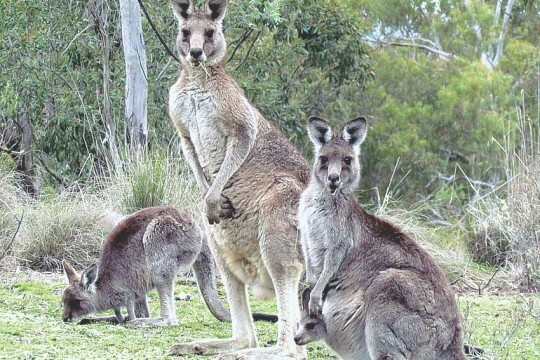 From her medical training, as well as training in biotechnology and zoology, Rosemary identified a herpes virus that has been causing a fatal respiratory illness in the area’s in-care joeys. She demonstrated that the illness could be successfully treated with a drug used in human medicine. Her partner Steve Garlick is a professor of economics and more recently has turned to research in animal behaviour and ethics. In the early 2000s he was a founder of the Animal Justice Party that now affords a political platform to animal issues in state and federal elections. Together they have written papers on the emotional lives of Australian native animals and their on-ground experience of post-traumatic stress disorder in these animals as well as trans-species learning. Exhibiting symptoms of post-traumatic stress as do humans — including inability to settle or relate, heightened anxiety and hypervigilance — rescued animals, and that includes domestic captives like pigs, need a destressing therapy routine and the opportunity of rebonding with others, not always of the same species. 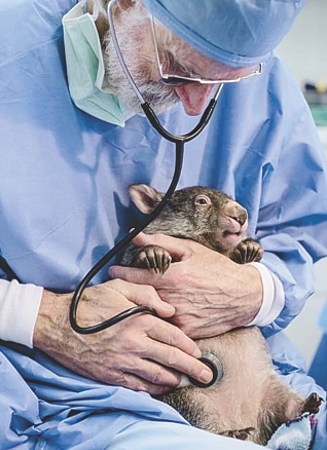 Kangaroos, wombats, birds, little possums and gliders that need emergency surgery end up in the clinic of another local legend — veterinarian Howard Ralph, a big man with hands to match, who performs the most intricate, seemingly miraculous repair work on small bodies. He’s known as the vet who can or will fix a broken kangaroo leg where others can’t or won’t. 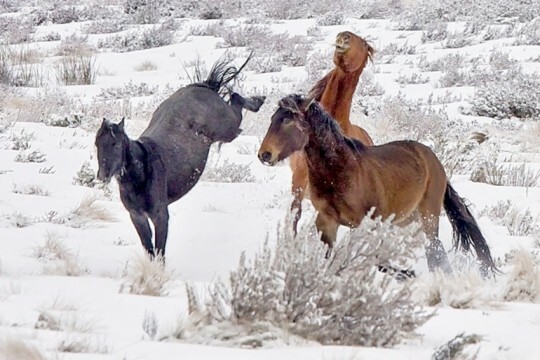 I talked to both of them, at an earlier time for articles, and more recently to learn what they have learned from working so closely with animals that are commonly lumped together as undifferentiated units in population needing management. 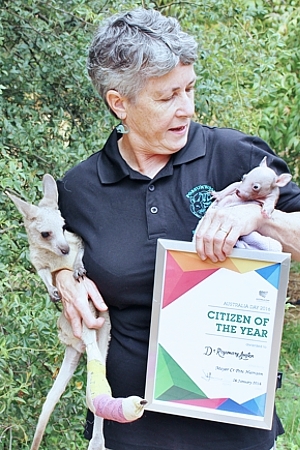 At an Australia Day ceremony in 2016, where she was honoured as Bungendore Citizen of the year, Rosemary Austen told the audience that many regional residents have been terrific in their concern for wildlife, bringing hundreds of injured creatures to Possumwood often in conjunction with Wildcare or the Native Animal Rescue Group. She highlighted the health benefits of getting involved and volunteering somewhere. She praised fellow honorees, the Bungendore Show workers, and admitted that she has allowed herself the time and pleasure to enter (and win) some flower arranging competitions at the annual show in early February. Later, I sit down with Rosemary at a Bungendore café. A small woman with short-cut greying hair and an unflappable, sweet manner, Rosemary is everyone’s favourite auntie, fronting an immense amount of professional training and physical stamina that she dedicates, along with Steve, to rescuing and releasing native animals. Most days she first puts in a full shift seeing human patients. At times she has ended her day by driving for two hours to a less populated release site to check on her kangaroo patients. Returning along a lonely country road at 1am she says that it’s not unusual to pick up another patient hit and left there by a human behind the wheel. Like the wombat with the spinal injury who could not roll over. Rosemary stopped and checked her pouch, at which point “the dear little thing opened her eyes and looked at me in terror”. Nevertheless a rescue had to be effected knowing that the wombat would either die of hypothermia or a fox would rip her open. So Rosemary rolled the big animal into a blanket, picked her up and took her home for assessment and care, or euthanasia. It wasn’t easy work. She does say ruefully that after 20 years of rescues, both she and Steve are not getting any younger. They are starting to notice the effort of picking up and carrying 30 or more kilo kangaroos caught in fences or hit by cars or wombats in this case. But that’s said as an aside. 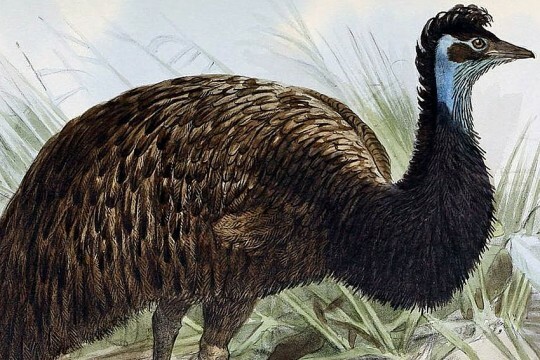 We talk about her animal patients and their personalities, an idea that is directly contrary to the prevailing wildlife science that deals with native animals as impersonal units in relation to human convenience or commerce or possibly a population to save. “Every animal, every kangaroo, wombat, possum, they all have different personalities. It’s very prominent in the Eastern Greys because they are such emotional animals, they really do relate to humans. She tells me a touching story from the neighbourhood involving a very big male kangaroo who got caught in a fence. To gain release he almost ripped his ankle off. He was very incapacitated and became very agitated when any rescuers came near. “The lady from the property was so upset, she really loved this kangaroo. And he knew the voices of the family. When this lady talked to him, he calmed right down — totally different body language.” She kept him calm as the decision was reached to euthanase him. “That family was devastated, it was very sad,” she says. She gives me a glimpse of the grim reality that Possumwood experiences on a regular basis. “(In one week) we had a 60 kg male motor vehicle accident at night; a very wild young male caught in wire; a hypothermic two kg joey with bilateral tibia fractures (he had been lying in a paddock in heavy rain all day); and a poor mother who had been shot in the face by a landholder on Bungendore Road. “The wound was seething with maggots and she was blinded by the bullet as it exited the face. Her joey was still alive but emaciated and severely dehydrated. A similar case from the same area a couple of weeks ago presented a kangaroo with its jaw blown off — it died. The killer tells people he has tags (permission issued by the NSW National Parks and Wildlife Service) and it has been reported that he goes out at night on his quad bike and shoots anything he can find. “[A fellow kangaroo defender] darted the mother and she seemed relaxed in our peaceful enclosure with the other kangaroos. 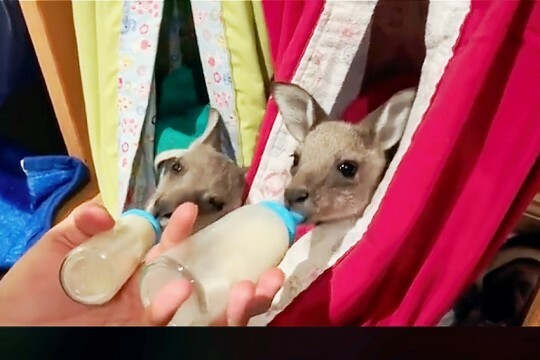 Little Ian, her joey, required intensive fluid treatment and nutrition.” Rosemary tells me later that both mother and joey did not survive. Complaints to the National Parks entity that hands out shooting tags about the incompetent shooting went unanswered as did complaints to the animal welfare organization RSPCA. 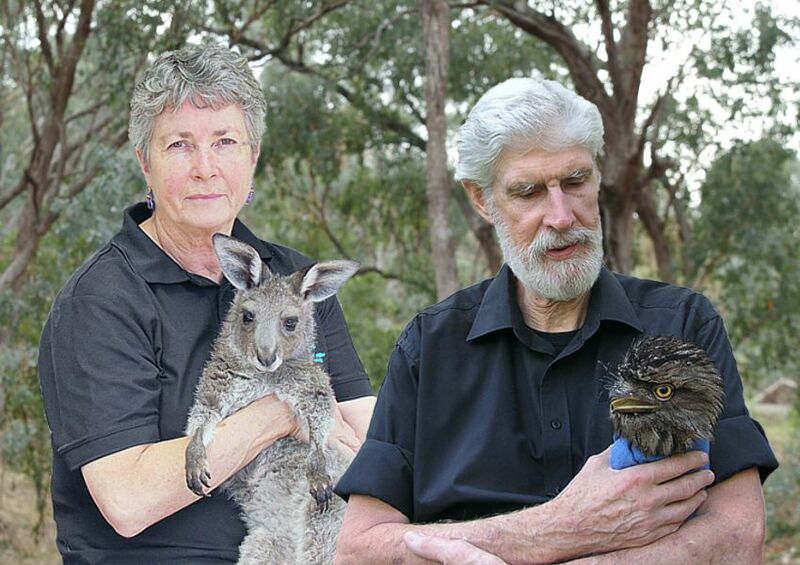 Howard Ralph, based near Braidwood, is indispensable to wildlife carers and they all call him Howard not ‘Dr’. He goes where other veterinarians don’t or won’t go and he has an awesome lifesaving track record. Here too the challenging part was the post-operative care which worked because ‘Tinkerbell’ was fairly habituated to humans and did not stress in confinement. Wild adult kangaroos are amongst the most challenging cases because of the need to restrict the patient in post-operative care and the stress that it causes. The operations Howard calls standard, but the post care is not, because kangaroos die of stress. All manner of birds are also brought in, like the tawny frogmouth that was completely paralysed. Howard treated him for several different infections of the brain and he recovered. The doctor does a lot of surgery on eye injuries and cataracts, because most wildlife cannot survive blind. His admirers say he’s never turned a person or an animal away. His clinic largely relies on a fund-raising charity and other donations and the considerable support to the enterprise of his wife Glenda who works as a physio and nurse (also both human and veterinary) in Braidwood and in Queanbeyan. Howard’s training as a paediatric anaesthetist came after he was already qualified in veterinary medicine. (He says part of the reason he got into human medicine is that he could then help out his elderly parents). The anaesthetist training honed his skills in getting tubes down narrow and short throats that often present in wildlife work. “He could have had an easy and wealthy life as an anaesthetist but instead he’s chosen this. He’s saved thousands of lives,” says one of a small cadre of dedicated volunteer assistants. Dr Howard Ralph at work. Howard Ralph is over six foot tall. His hands are commensurately large. It’s hard not to marvel at how he does such delicate surgery on some pretty small anatomy. Asked to recount a recent challenging case, he tells of a wildlife carer who brought in a two kg baby wombat which looked alright but had a terrible smell coming from a small hole in its head. It was infected, and on examination related to a compound fracture of the skull which was starting to destroy the brain. Several multi-hour skull operations were followed by a post-operative period just like a human case with tubes and monitoring. The wombat survived and is now doing well. Howard says he is busting the myth that wildlife cannot be treated successfully and chose to dedicate himself to that arena after seeing the effects of the bushfires on the South Coast of NSW in 2000. He later volunteered following floods in Queensland and after the Black Saturday bushfires in Victoria. Those had a horrific impact on wildlife (swamp wallabies with their eyes burned out, faces burned off and so forth) with very minimal help available. Howard and Glenda’s wildlife clinic is tucked away on an old farmstead dominated by remnant bushland not far from Braidwood. As I arrive for a catchup interview on a Sunday morning, I encounter a man from somewhere north of Tamworth (an eight hour drive of about 900 km) who had driven down with a joey suffering from fractures to both back legs due to car strike. The three-hour operation on the young Eastern Grey kangaroo repaired the fractured tibia bones and undid some crooked healing that had already taken place. The patient had splints on both legs from hip to toe and was expected to make a rapid recovery back at the carer’s place in northern NSW. These days Howard is consulted by other veterinary surgeons and carers from around Australia and even internationally. With interest increasing, there are still varying opinions amongst veterinary practitioners about the value of treating wildlife and also there is still a widespread lack of experience in dealing with the more complicated surgical cases — coming after many decades marked by the common practice to simply shoot badly-injured wildlife. The money is another issue. Howard’s clinic is supported by fund-raising; by community volunteers and by the work both he and Glenda do in human medicine. It’s barely enough to cover the need. But most vets don’t have such support and medicine is expensive. So it is not unusual for Howard to receive an unexpected patient from far away, as on this day, or from even further afield. That’s in addition to the flow of local wombats in particular, or of kangaroos or other wildlife that have come off second best tangling with humans and their machines or fences. Howard also trains nurses and veterinary students. He thinks that there is a turning tide in Australia of better understanding and appreciation for the wildlife and what is being done to the animals. On the other hand, he has also received death threats and promises of violence. He sees enormous forces still arrayed on the side of traditional views and against defenders of wildlife. He’s been told that he’s wasting his time on numerous occasions. For example, by duck hunters who enjoy blasting the fragile life flying overhead and don’t appreciate the volunteers who try to help the wounded on the ground during duck hunting season. He has seen volunteers roughed up, taunted and threatened. 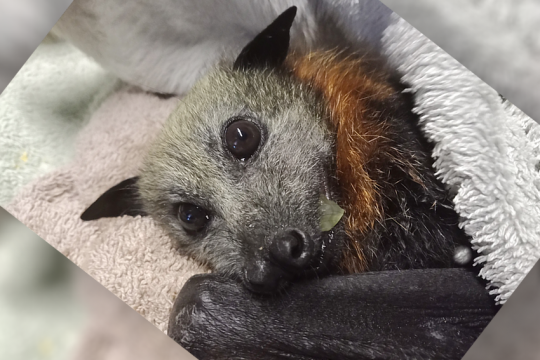 It has also happened to him as he prepared to help critically-injured wildlife in the aftermath of the horrific bushfires that destroy a lot more than human property. He’s been pushed around by property owners who say the only concern has to be humans. And criticism comes not only from frightened property owners and duck hunters. 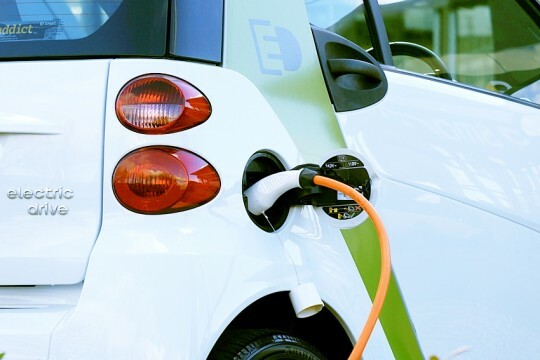 Howard often hears a familiar narrative from people who see themselves as environmentalists or scientifically trained. “People say to us, firstly what you’re doing is a waste of time. Secondly, it doesn’t consider the survival of threatened and endangered species. Both of those things are not true. And thirdly they say, from a biological perspective, we’re not really interested in ‘a’ kangaroo, we’re interested in a population. Howard has travelled widely and knows that in many places there is no wildlife left. He has hosted international veterinary practitioners and journalists. 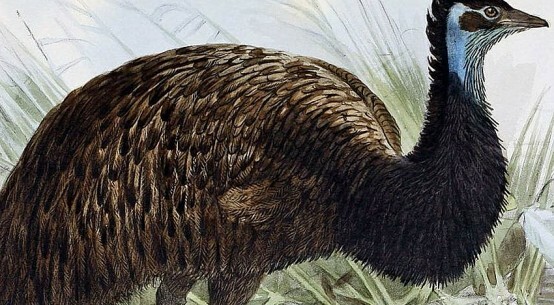 “You talk to people from other countries and they are always astounded at how disrespectful we are to our precious wildlife,” he says noting Australian domestic narratives about wildlife still often depict these animals as either a pest or a resource and that it’s a hangover from the colonial days. Many people have only a fuzzy or non-existent understanding of ecology, the web of life, and how plants, animals (including all the micro-organisms) and the landscape that we depend on, have co-evolved. There is just a bedrock belief that technology will save us regardless of what we do, he says. What are kangaroos like personally? I ask him what is his experience with macropods, the kangaroos on a personal, behavioural level? They are all different, he answers — physiology, behaviour, different age groups, and response to treatment or anaesthesia requiring different levels of sedation and post-operative care — which makes his work such a specialised field. “They are all individuals, not just a furry opportunity to kill something. “Talking about Eastern Grey kangaroos, being the ones that get the worst rap usually, they’re lovely creatures in fact. They are quite endearing, very gentle in their behaviour. Just because some large male kangaroo that is protecting the mob gets cranky when people invade, that’s normal. “From our perspective, we’re dealing with them all the time, they are very gentle and quite tuned into human behaviour and needs. Even though they come from the wild, in a very short time they adapt to what we need them to do, with feeding and so forth. “The other thing is that they are very sensitive creatures, so that if they are not treated with some dignity they really do suffer badly from a number of conditions that occur and are well known and that can be fatal, like myopathy. “We see it all the time and it’s a lot more complex and wide-spread than you would see from a text book. Any significant stress or upset can precipitate them going into skeletal or cardio myopathy in particular. Then they die of heart failure, either straight away or in a month or two months’ time, and kidney failure. It’s quite complicated. Most people don’t know even their most photogenic and cuddly wildlife neighbours as individuals. I tell Howard that I talk to the kangaroos that stay close to the house and even further afield. They have come to recognise my voice, visibly relaxing when this human shape in front of them talks in a friendly fashion. They come off alert posture, and return to feeding or stand around and scratch. I jokingly ask whether I’m putting them into stress by saying ‘no’ some days when they come around to be fed? Howard smiles and won’t quite rule out that possibility. What was a particularly challenging recent case? I ask. Howard recalls the case of a young adult female who was brought in after being hit by a car. 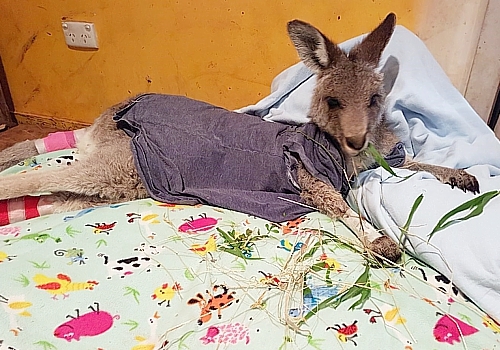 Rosemary brought in the young doe, one of two female kangaroos with joeys in pouch, both hit by a vehicle at a major interchange outside Canberra. Melody recovering at Possumwood. Image supplied. One mum didn’t make it but the other, Melody, as this patient was named, was rescued by a good Samaritan, risking his own life against the commuting drivers, some of whom didn’t want to swerve for animal or rescuer. A couple of army personnel also stopped to help get the dead and injured off the road. Melody was having trouble breathing and was in significant difficulty. It turned out that she had a ruptured diaphragm. This is called a diaphragmatic hernia in which abdominal matter works its way into the chest cavity. Gradually more and more of the stomach, bowel and liver contents work their way into the chest and impact the lungs so the patient can’t breathe and dies. The only real treatment is to repair the hernia. So in the course of a four-hour open chest cavity surgery, Howard performed the challenging business of repairing the tear or hernia; after first finding and accessing it. Then he removed all the stomach material from the chest cavity. The anaesthetic was difficult because in this case the lung had to be ventilated and procedures instituted to ensure the lung did not collapse. “All in all a fairly complicated thing”, he says with trademark modesty, adding that this method is standard medical practice for all creatures. In his clinic it’s all part of demonstrating daily that the same works for wildlife. Other challenges are met in different ways. Like the case of one baby wombat; one of many whose mothers are killed on the road. This baby was in the pouch but the legs were protruding. A fox came on the scene and began eating the baby starting with the feet. So Howard and his nurses reconstructed her ‘fingers’ on the front foot, having to lengthen some and reduce others so she eventually ended up with a normal foot. She grew up to be a normal functioning released wombat. The post-operative stage is the next challenging hurdle. Many wildlife carers have been trained here how to keep going with medications, dressings and monitoring in the recovery stage. Here again, stress more than physical response can be the killer. 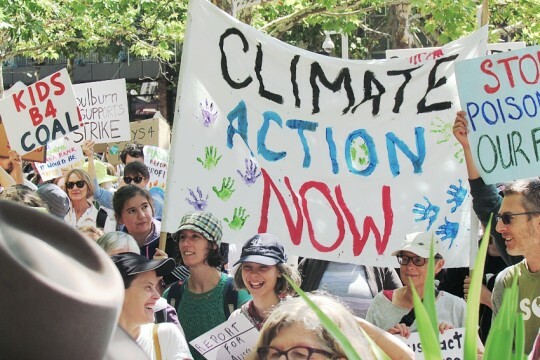 Turning to human stress, we talk about the pressure facing the relatively small number of activists, rescuers and animal first responders in a society that officially does not share these values. It is often like being in a war-zone, concedes Howard. “I’ve known people in my medical career that have been to things like the duck shooting. Facing shooters on any front and the negative, aggressive, hostile contact they face really does take its toll. 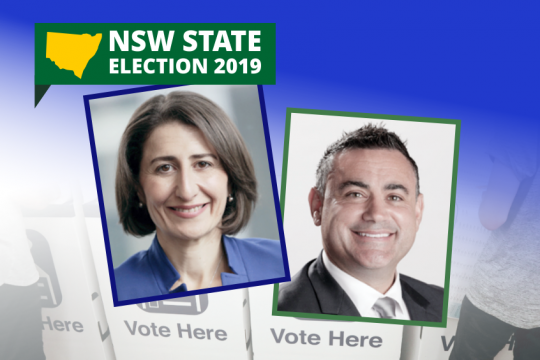 Attending things like these so-called culls (as in neighbouring Canberra) and seeing the end result and rescuing those that are not dead yet … these people do suffer things like post-traumatic stress, coping with the awful things they witness. “I know three people during duck shooting who were shot. Two I referred to the local hospital and to the local police who were not the slightest bit interested because we were rescuers. Despite the personal cost, Howard thinks those rescuing and defending wildlife do have increasing influence in Australian society as more people are realising the true picture of what has been going on and the pain and suffering involved. Veterinary surgeons and nurses are coming to training courses he gives all over Australia. There is more realisation that all wildlife species are part of the ecology. People, he says have a responsibility to treat them better and accept the fact that you live in a world with other creatures. It’s not an easy experience for those citizens who have volunteered to fill the void created by poor or non-existent public policy and care for all of the nation’s wildlife. There is the ever-present question about how and where to release rehabilitated wildlife and the eventual realisation of personal burnout. As with other national volunteer organisations (not least the voluntary fire services) the average age of wildlife carers is in the 50s, 60s, and 70s. 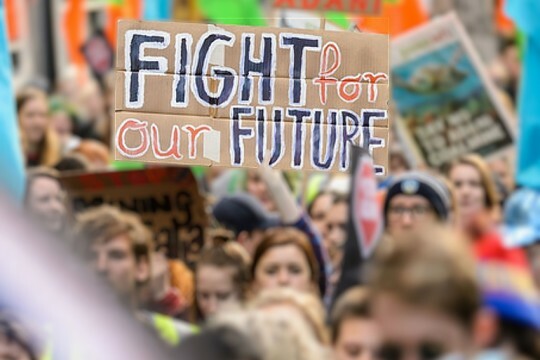 Will there be a new generation picking up the pieces when these baby boomers retire for good, or can this generation finally hope for true conservation in public policy? Thank you so much for writing this beautiful piece. We are lucky enough to live on the NSW South Coast and have released three kangaroos who wouldn’t be alive today if not for Howard and his team of heroes.